Upon receiving my gently used Class B RV from the previous owner and armed with a crash course in the operation of the house and cab, I left California for Las Vegas to visit my cousins and get a very simple evaluation of my motorhome. The drive in the mountains and through the desert verified for me the solid state of the engine, cooling system and brakes. So far so good! Hoses and belts: look good. Water stains on rear wall: readjust rear door on hinges to close small gap. Van exterior: clean, no rust, well cared for. Undercarriage: no signs of leaks or damage. Some things might have to wait to know more. Like with the sanitation/sewer system, the furnace and stove: some issues might reveal themselves under use. I was anxious to get underway and to learn by doing. 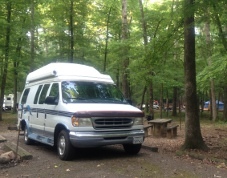 Driveway camping in a Class B RV is easy but not very much fun! I decided to take I 40 across the south. Two and a half weeks to get to my daughter's in VA by her birthday. Time enough to learn plenty during my RV Basic Training. Park on as level a spot as possible. Turn on the propane and set the thermostat on the furnace before going to bed. How and when to dump: 5-6 days max when boondocking or dry camping as a solo RVer, more if I used public restrooms often. How to recognize and deal with gray water backup - Thank the Lord that it was only the gray! To use the inverter for short durations so as not to drain the house battery. Spray silicone lubricant is a key awning accessory. That I needed a campground guide book- I did get this early on in AZ. To ask first when boondocking in Walmart or Sams Club - I was never turned down though! Have a Y fitting with valves for water hook-ups in case you have to share the faucet. How to make a campfire starter using dryer lint. Keep an extra set of keys in a magnetic box hidden on the vehicle - Thank the Lord again for a savvy camp host in the Ozarks and her son who broke into my RV. That RVers are friendly, open and generous people. To slow down: I'm not sure I really did completely. . . it's a process I look forward to perfecting. Initial experiences aside, there are some skills that come from repetition and that will come. I've been told to make a checklist, much like a pilot uses for take off. I will be sure to do so before taking off for my RV Vagabond adventures. And I'll update this page when I do. A used RV also has need of being polished and perfected. I was told that the sanitary system would need new O rings on the valves. This is to prevent pressure leaks that cause seepage that happens when taking off the cover to put on the sewer hose. And a state inspection revealed bad ball joints on the front end and the rear ones beginning to break down. So all four were replaced. My Used Class B RV Search has come to it's completion. Now I can concentrate on the home front and make arrangements to rent my condo, sell my car and begin planning for the launch of my RV Vagabond lifestyle.